Everyone here at May Dreams Gardens is quite excited to be included as one of Horticulture magazine's Best Gardening Blogs. Apparently, they asked Thorn Goblinfly, the chief scribe of the garden fairies around here what she thought of the idea and she thought quite a lot of it. She also kept it a secret from everyone else. Garden fairies are good at keeping secrets, apparently. It does make me wonder what other gardening secrets they have to share with me. Hortense Hoelove, Dr Hortfreud, and the Old Woman at the Door were pleased to be mentioned in the write up posted on the Horticulture website, but as expected, were a little miffed that Thorn kept the secret from them, too. I'm sure there will be discussions amongst them all about that. I'll stay out of it, if I can. There's no benefit for me to pick sides in a debate about who's who around here. I will always have a soft spot for Horticulture magazine and their editors because they were the first to publish something I wrote. No matter what anyone tells you, opening up a magazine and seeing your name on a by-line is a wonderful thing. 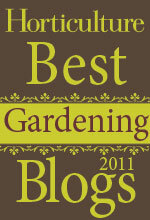 It's also a wonderful thing to be one of their Best Gardening Blogs. Thank you to Jenny Koester for choosing my blog this month and for the wonderful, creative way she did it. It is no secret that May Dreams Gardens is one of the best blogs. I was lucky to find it almost instantly when I first started blogging nearly four years ago. Carol, you are always an inspiration. May Dreams is the best, no doubt. Congratulations to you, the Garden Faeries and all the who's who. Horticulture has it absolutely correct! Congratulations! I have only been following garden blogs since May. I am in awe of the talent out there- as gardeners and writers. May Dreams Gardens blog makes my heart happy! Congrats Carol. I am glad you were recognized as a great blog. You keep us entertained all the while teaching us. Keep up the good work. I know you will do this since you have all of the great helpers listed here, fairies, Drs etc. Many congratulations - it's well deserved. Congratulations. You truly have a wonderful blog. This is a well deserved award. A big congratulations, Carol! A well-deserved honor. This reminds me that I had intended to email you the day I opened up my last issue of Horticulture and saw your article about being eccentric. I can only imagine how excited you must have been to see your work in print--I know I was excited to see your name, too, and thought "hey, I know Carol!" Congratulations! I don't think anyone would dispute that May Dreams Gardens is a blog that deserves high honors. I certainly enjoy it, and I always enjoy Garden Bloggers Bloom Day! Congratulations! I enjoy reading your blog and the adventures of the garden fairies! It takes my mind off of the horrible Texas weather. It was 103 today. Congratulations! And so very well deserved! I'm tickled for you!! !